The best thing to happen to the Phoenix Coyotes this season are the Florida Panthers, who have become the NHL’s primary source of empty seat mockery. If only the Coyotes had the Panthers’ attendance (or their creative accounting). Florida is averaging 14,050 tickets distributed in 18 home dates. 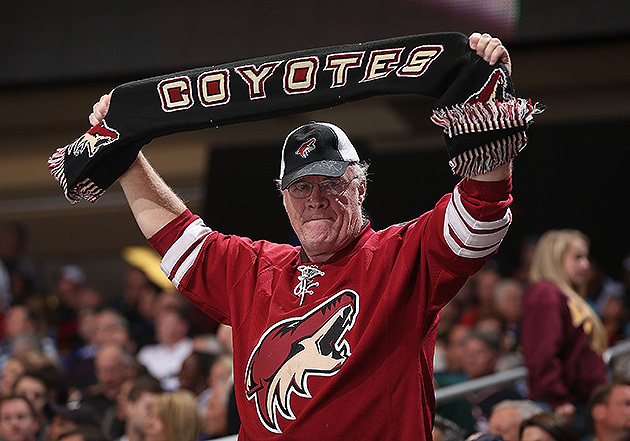 Phoenix is averaging 12,662 tickets distributed in 15 home dates, last in the NHL. Question: More than two months into the season, what have you made of the team’s attendance? Answer: I’m probably a little disappointed in where we are with attendance. There are those marquee games like the Chicago game, which was obviously a very big night for us from the perspective that we broke the regular-season franchise record for gate revenue for a single game. But (two weeks ago), we had the Islanders and Carolina in town and there was roughly 10,000, 11,000 people in the building, and that’s simply not good enough. So we know those are the nights we have a lot of work to do. … Our next home game on the 27th against San Jose, that’s going to be a sellout, as well. That’s encouraging. I’m not saying San Jose is not a marquee game, but in the past it hasn’t sold as well as it’s selling this year. So that’s encouraging, but overall it would be unfair for me to say that I’m thrilled with where things are. There are some positives, but there’s a lot more work. We need stronger support. They do, and anyone that believed it would arrive the minute the ink dried on the sale agreement was deluding themselves. This group is still laying the groundwork to rebuild an apathetic and jaded fan base. They’ve yet to dive into an offseason to make a splash. They’ve yet to sell what it is this Coyotes team is to the general populace, which is a more offensively dynamic team than they’ve had. It’s a formula the Coyotes have been trying to figure out for years, although now they’re doing it with solid ownership. But that doesn’t mean Canada won’t still be watching.